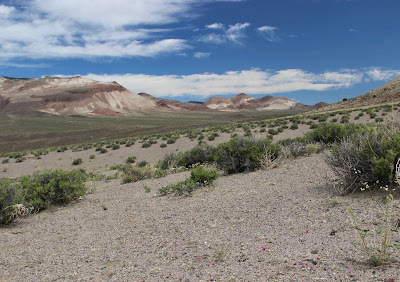 In late May, I drove Highway 773 through the Volcanic Hills in western Nevada, about 45 miles west of Tonopah. 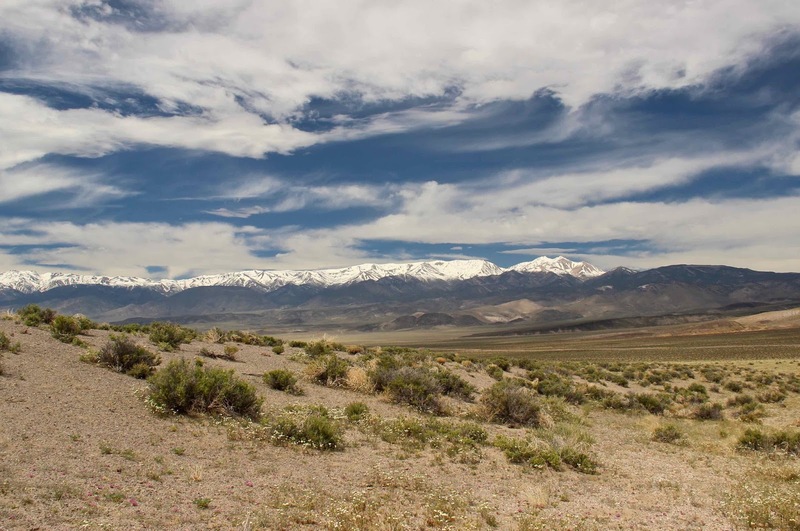 It was harsh but beautiful country, with colorful rocks dating to roughly 20 million years ago, back when Nevada was a truly hellacious place. Huge calderas erupted on a massive and terrifying scale. Viscous magma exploded from vents, and fiery sheets of ash and debris raced across the land, destroying everything for miles. Intent on examining the remains of that horrifying time, I turned off on the first promising two-track, parked at the toe of a sparsely-vegetated (so I thought!) alluvial fan leading up to multi-colored outcrops, and started walking. But I didn’t get far. I was stopped by hundreds of flecks of color on the ground. 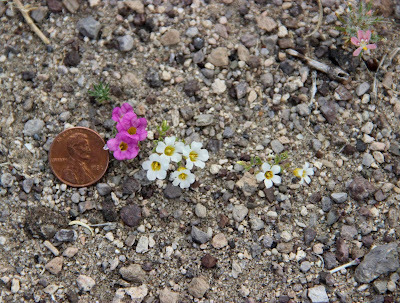 In between the shrubs, tiny plants were blooming. 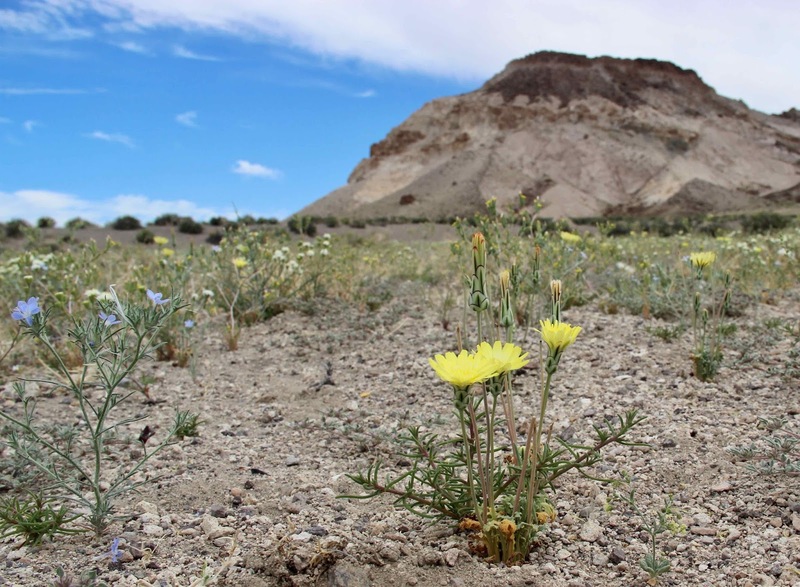 I suppose the show was lackluster compared with this year’s super bloom of the lower deserts—annuals so thick that they formed carpets of color. But I was impressed! It was such a surprise, and in some ways more rewarding. Only when I looked close did I see the beauty. 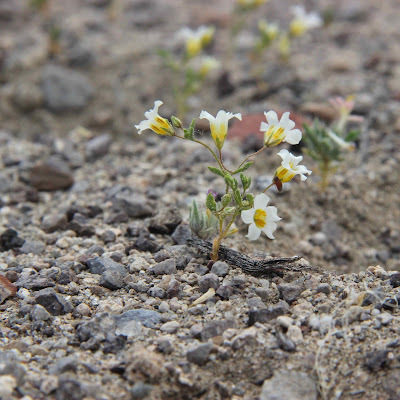 The subdued display seemed fitting for the high desert, with its shorter growing season and harsh winters. Click on image to see flecks of color (maybe). I never made it to the volcanic rocks—spent a lot of time happily photographing flowers instead. Here are of some of the more common ones, all new to me. A humongous thanks to randomtruth at Nature of a Man for identifications … saved me from major struggles! 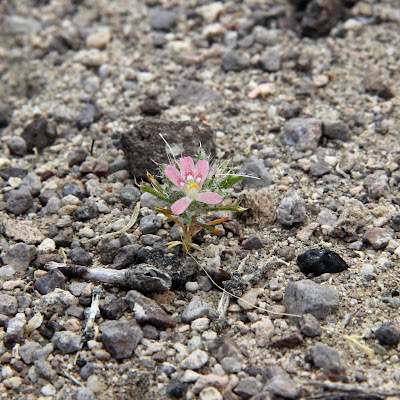 Many were true belly plants—little annuals growing so close to the ground that I had to lie on my belly to get a good look (for scale, see photo at top of post). The first to catch my eye was ground nama, Nama aretioides (Boraginaceae), which was super common. 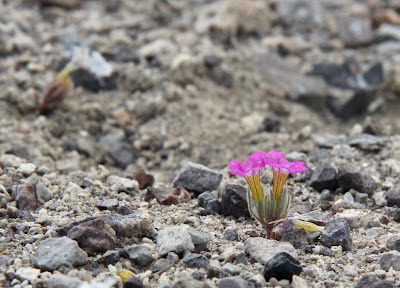 Up close it looked like a fairy’s flower arrangement—miniature bright pink flowers with yellow throats streaked red, and tidy clusters of hairy leaves. 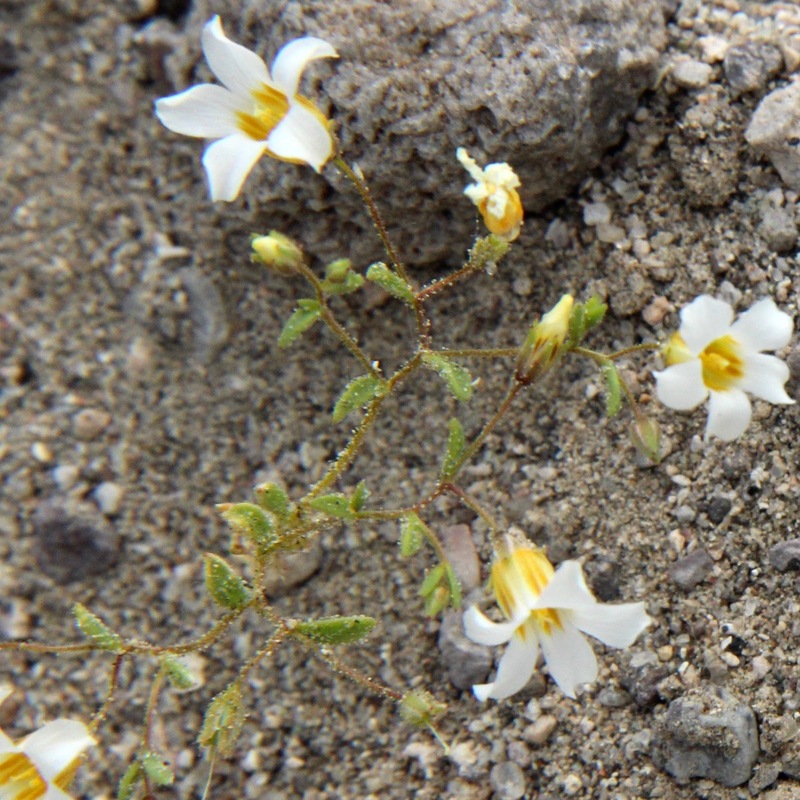 Desert calico (Loeseliastrum matthewsii, Polemoniaceae) has really distinctive bilateral flowers. For some reason they reminded me of surprised faces, maybe because of their dark pink "raised eyebrows." I like the common name, but couldn’t find an explanation for it. Maybe the flowers are enough mottled or multicolored to qualify as calico. Apparently Linanthus campanulatus (Polemoniaceae) goes only by the awkward common name of bellshape gilia, a literal translation of an earlier scientific name, Gilia campanulatus. Sand grains stick to its stems because of its glandular hairs. 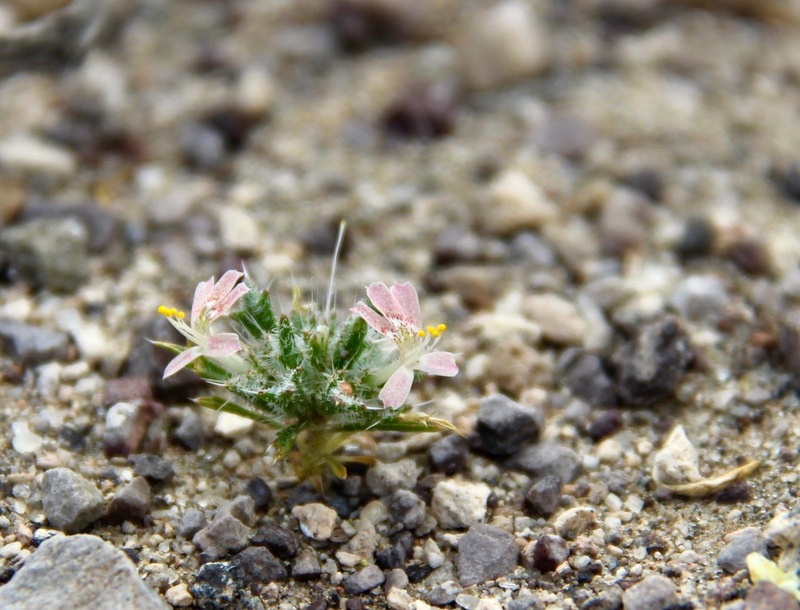 I easily recognized this next plant as a cryptantha (Boraginaceae), maybe because of the hairs—glassy spikes like those of many of our cryptanthas. This is cushion cryptantha or cushion catseye (C. circumscissa). 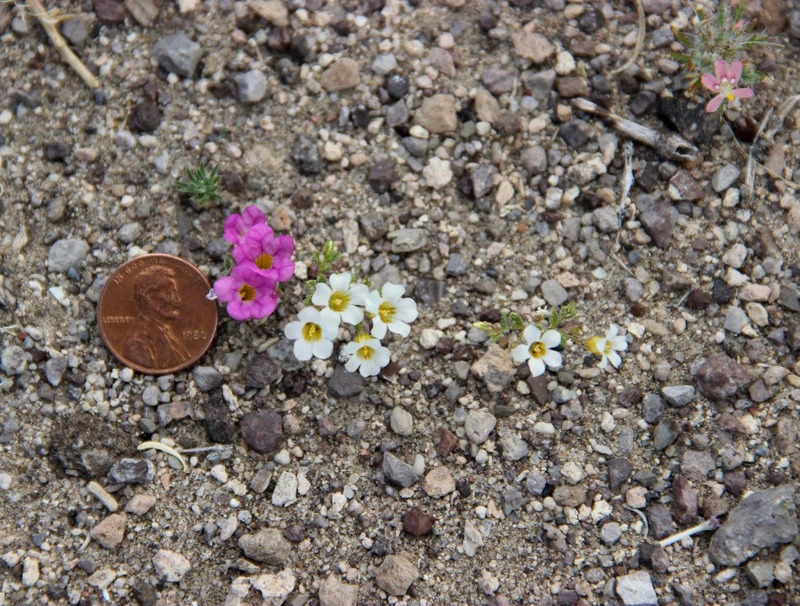 Flowers are super tiny, about 1/8 inch across (1-2 mm). Signs of a belly-plant botanist. Eventually I left the land of belly plants (above) and moved into a swale (below) where plants were denser and taller—must be (or have been) more water. These also were mostly annuals, just bigger. 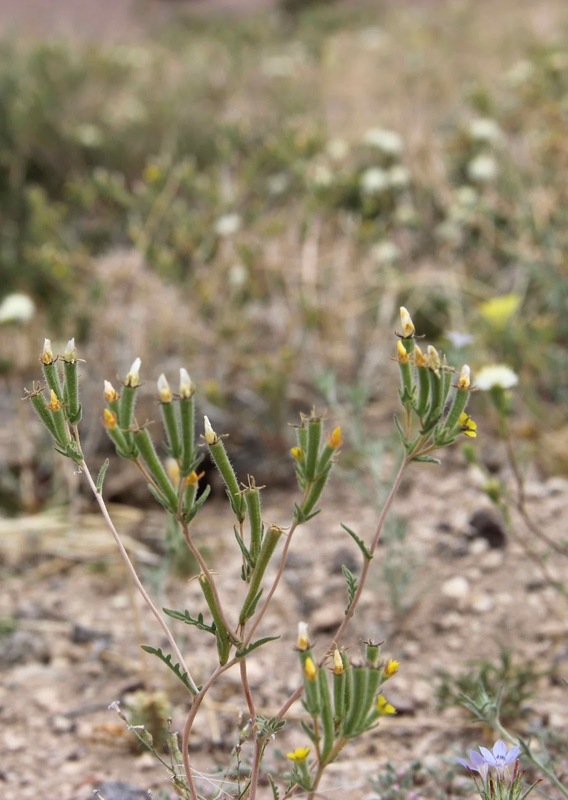 The mentzelia (stickleaf) below was another plant I could recognize to genus, probably because of the pale stems and rough leaves. 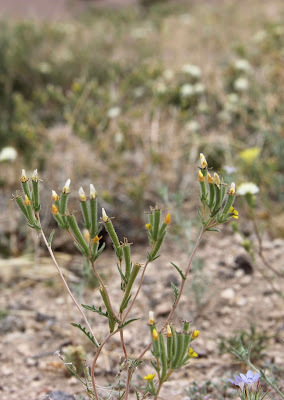 It may be Mentzelia dispersa or M. affinis (Loasaceae). According to experts, the two are almost impossible to tell apart based on appearance. They differ clearly only in habitat: “Verified populations of M. affinis have not been found above 1200 meters in desert habitats” (Flora of North America). The alluvial fan was at 1800 m (6000 ft), does that make this M. dispersa? Can we rely on such a simple criterion? Of course the name didn’t really matter—I enjoyed the plants just fine without it. 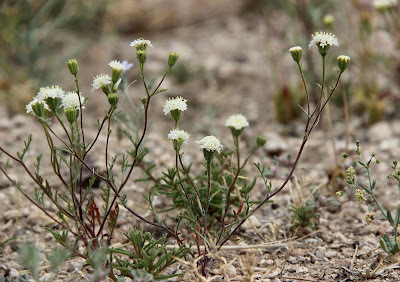 Desert or Esteve’s pincushion (Chaenactis stevioides, Asteraceae) is said to be “among the most abundant spring wildflowers in the higher Mojave Desert and southern Great Basin” (Flora of North America). 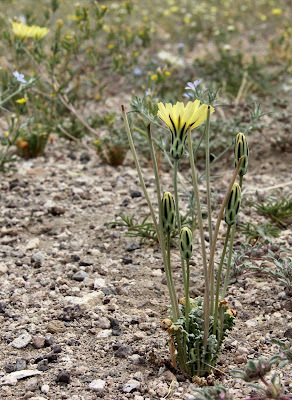 The Volcanic Hills are in the southern Great Basin and this plant was indeed abundant. It grows through much of the American West. 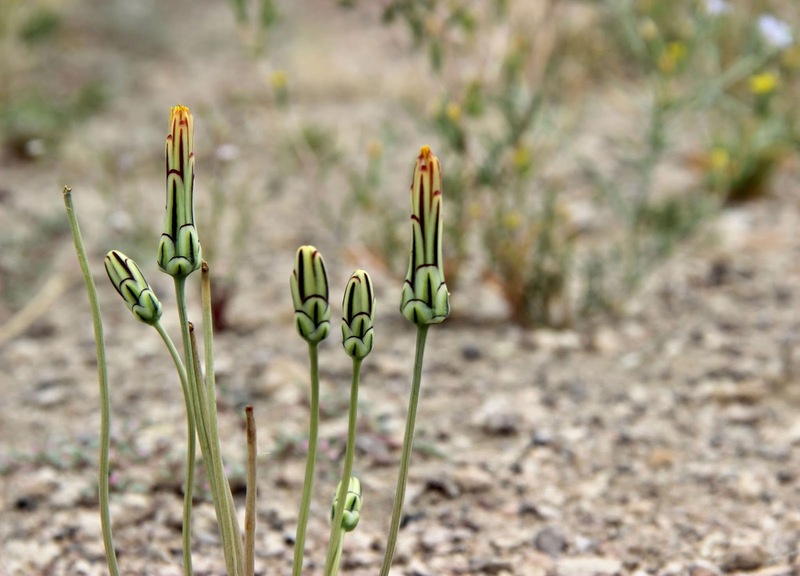 I thought the scale buds (Anisocoma acaulis, Asteraceae) were especially photogenic. These are not to be confused with bud scales, which protect over-wintering buds. 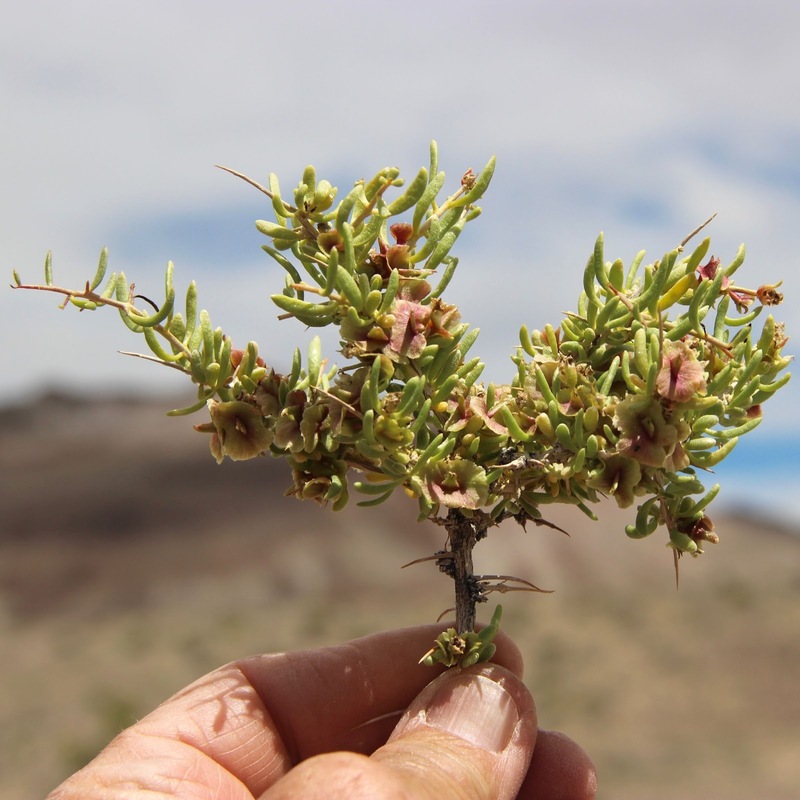 Scale bud is named for its distinctive patterned phyllaries (bracts), most obvious when the flower (head) is closed. 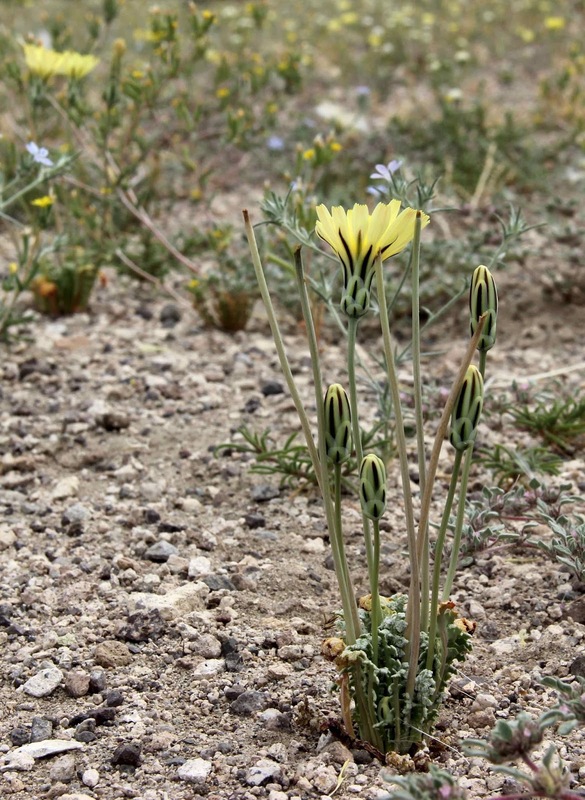 It’s the only species in its genus, which is closely related to Malacothrix. Obviously someone finds scale buds tasty—missing heads were common. Fortunately I didn't ignore the shrubs. They too surprised me with something new. The alluvial fan was covered in greasewood (Sarcobatus vermiculatus, Sarcobataceae), a very familiar plant but not the kind of greasewood vegetation I know. I looked close just to be sure ... yep, greasewood. Succulent green leaves and sharp-tipped twigs make greasewood easy to recognize. 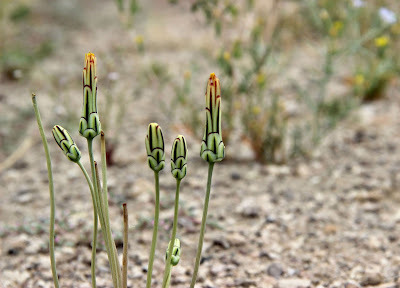 The reddish structures are its distinctive winged seed pods. 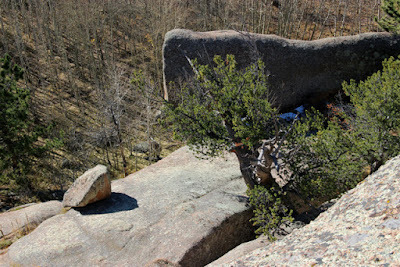 Here in Wyoming, we say greasewood grows in valley bottoms where water is near the surface, usually on saline soil (1). But it appears to be doing just fine on alluvial fans in the Volcanic Hills. Greasewood on alluvial fan; White Mountains on horizon. (1) Knight et al. 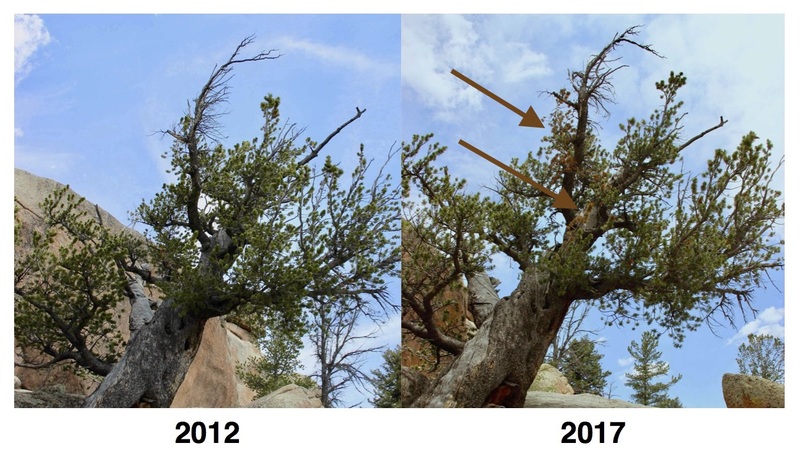 (2014, Mountains and Plains, the ecology of Wyoming landscapes, p. 167) mention there are a few stands of greasewood in foothills, calling them an “anomaly” … “as it is usually found where groundwater is near the surface on saline soils …” However, Waring (2011, A Natural History of the Intermountain West, p. 146) includes badlands and playa dunes, as well as saline bottoms, as greasewood habitat. Two websites were especially helpful for verifying identifications and learning more about these plants. 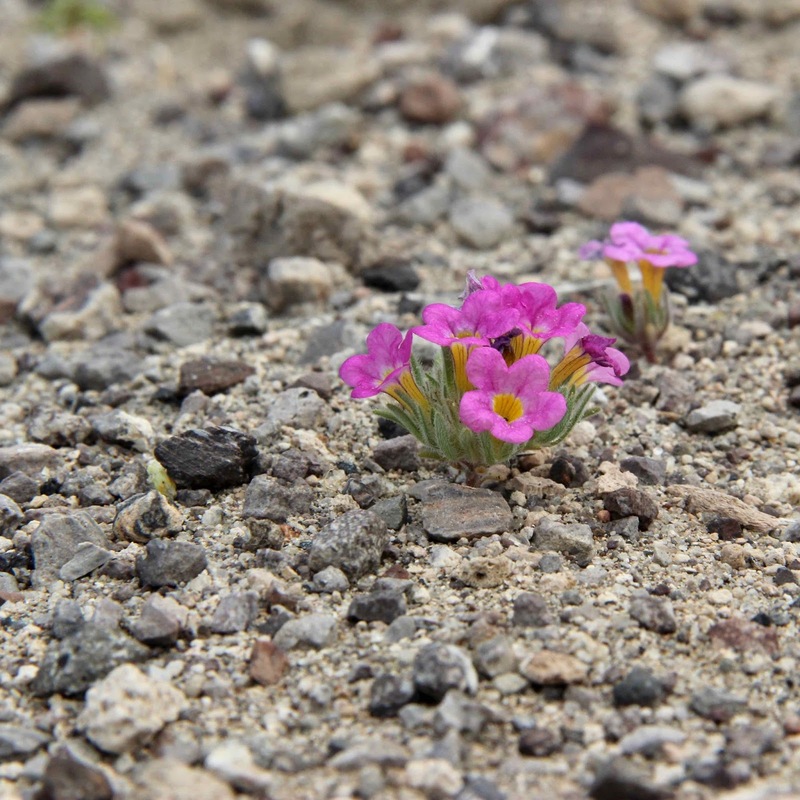 Foremost was the awesome Calflora (the Volcanic Hills are just 15 air miles east of California). 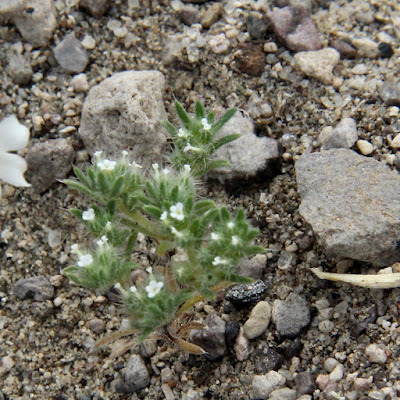 Plants of West and Southwest USA was useful for selected species. 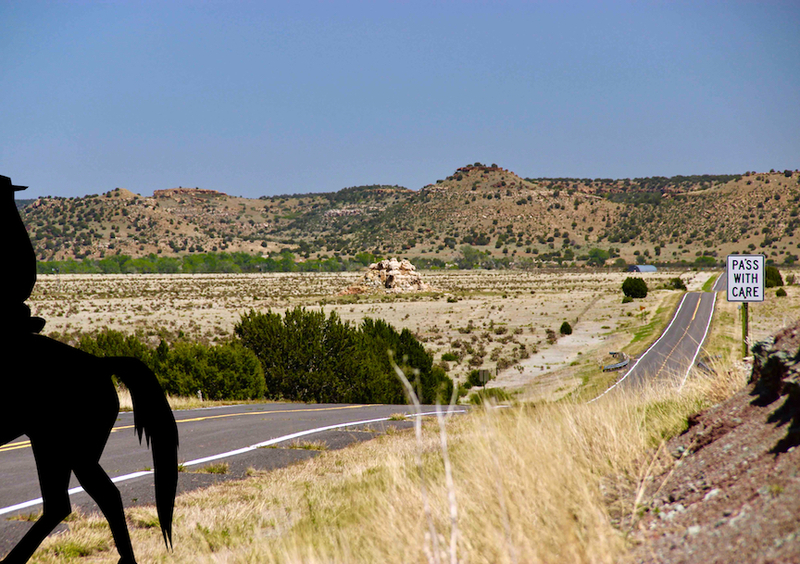 On a cool sunny day in May, I drove New Mexico State Road 456 down the valley of the evocative Dry Cimarron River. For hours I saw no one, aside from ghostly travelers conjured up by “Cimarron”—dusty men on wild-eyed horses, traders with heavily-loaded mules, armed banditos lurking behind the rocks, and gaunt men of God driven by the other-worldly light in their eyes. But they didn’t notice me, never stopped. 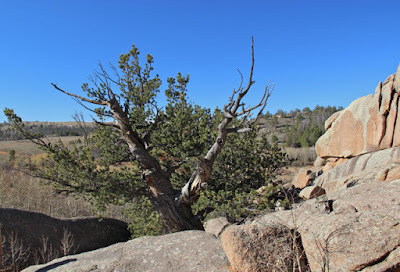 Only when I parked near a contorted sandstone outcrop was my solitude interrupted, by a brand new white Cadillac with Texas plates. “Ya’all need help?” “No, just trying to understand these rocks … but they aren't saying much.” The older couple looked suspicious so I added “I’m a geologist” (1). They smiled and drove off. 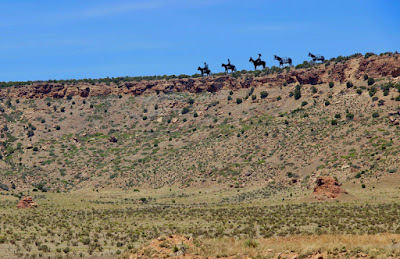 Pillars of sandstone lie scattered—in no obvious pattern—across the valley of the Dry Cimarron. Baldwin and Muehlberger (1959) mapped 170; counting those in nearby Oklahoma and Colorado, there may be close to 200 in all. Height ranges from 20 to 70 feet, diameter from 10 to 300. Shafts dug nearby revealed that pillars extend beneath the surface, at least 350 feet in one case (Parker 1933). 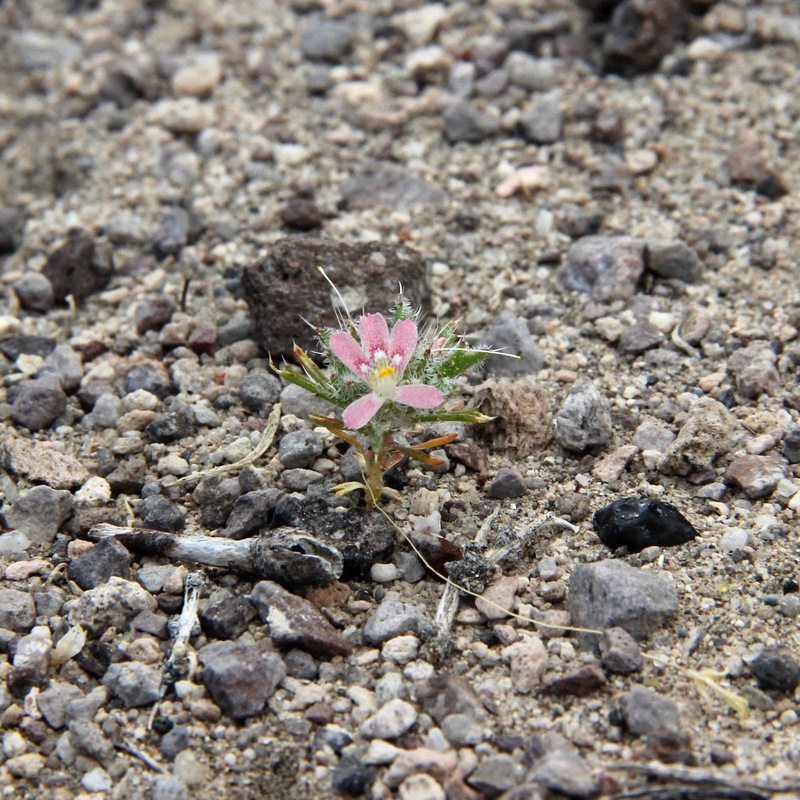 There's a red pillar in the center of the photo, in a cholla field; close-up below. Red sandstone plugs below rimrock. 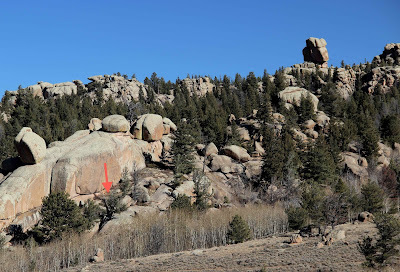 There are some clues (italicized) as to how these outcrops came to be. 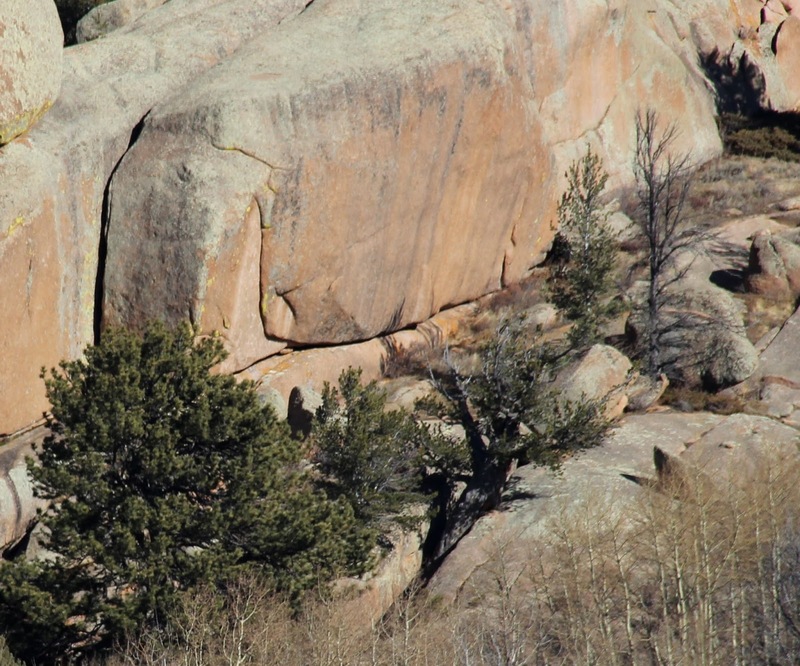 The sandstone shows no horizontal stratification. 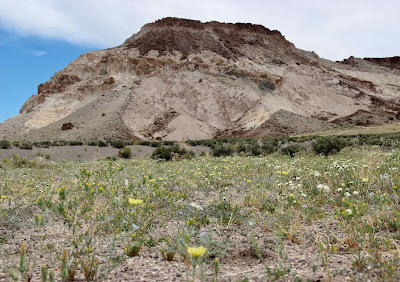 The sand grains match those of sandstone layers in the Triassic Dockum group (2), specifically the Baldy Hill formation (Baldwin and Muehlberger 1959) which is 400-1000 feet underground. Often the sand is mixed with angular blocks of country rock. The pillars are (always?) surrounded by ring fractures (Muehlberger et al. 2005), and many are associated with enriched mineral deposits (Parker 1933). The few relevant sources I found call these outcrops clastic plugs—“clastic” because they contain fragments of country rock, and “plugs” because they developed underground in a fashion similar to volcanic plugs. In other words, they’re intrusive (3). Parker 1933 (modified). Red line indicates timing, not physical position. The Baldy Hill formation (Dockum group) probably supplied sand; country rock clasts are mainly Sloan Canyon and Sheep Pen sandstones. It’s thought that the plugs formed when liquified sand moved hundreds of feet up through overlying rock and then stopped before reaching the surface, where it solidified into sandstone. 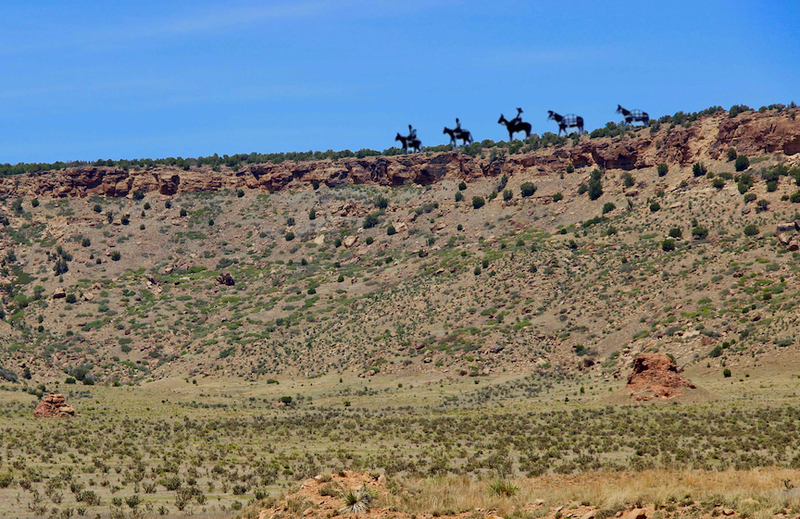 When the Dry Cimarron cut its valley millions of years later, the plugs were left standing above the floor. Apparently they're harder than surrounding rocks, probably due to mineralization. Parker found that 50 of the 138 plugs he studied showed distinct mineralization. Several have been worked for copper on a small scale. Note mining remains on right. 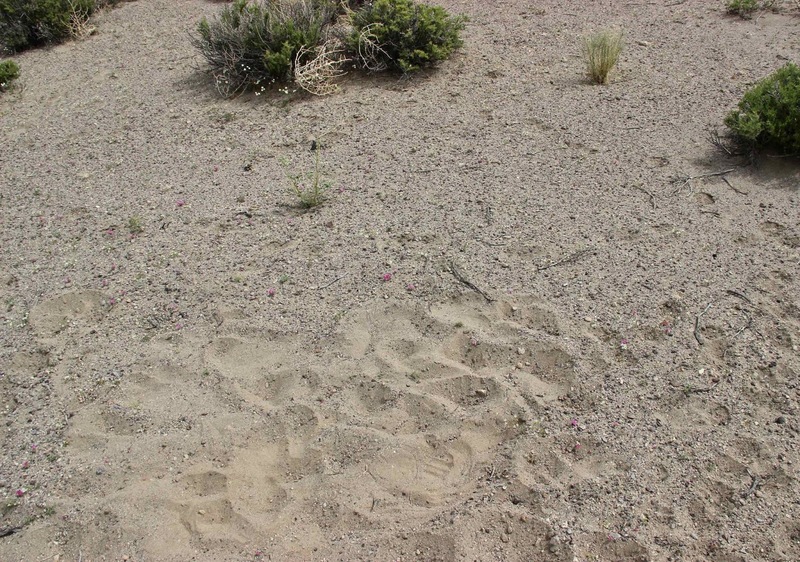 No one knows why or how the buried sand become liquified, nor how it was able to move up through so much rock. Parker (1933) suggested that earthquakes associated with faulting mobilized the sand, and fractured the overlying rock—creating paths and adding fragments of country rock. 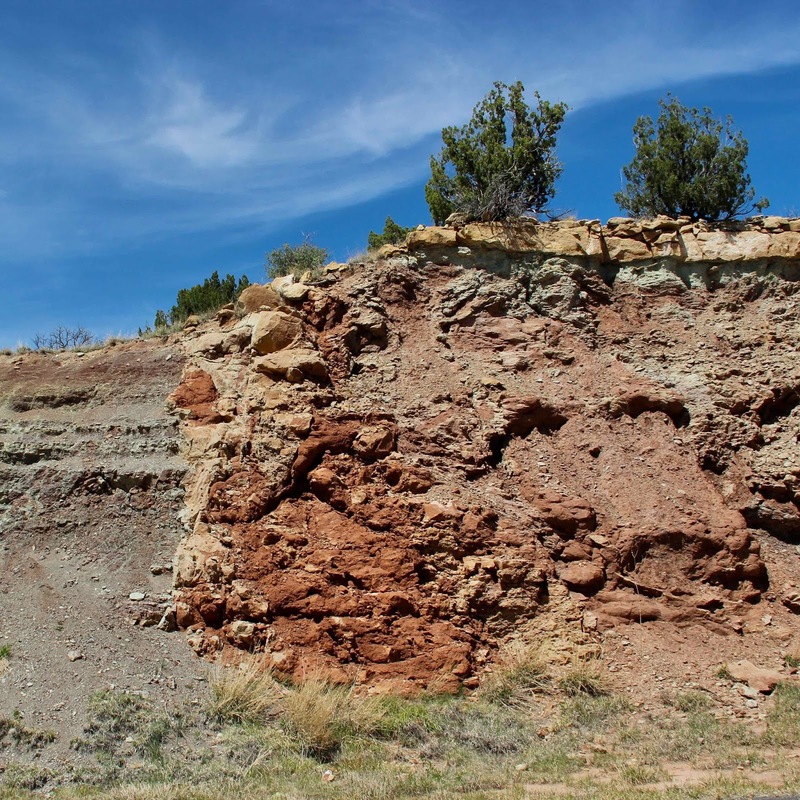 Liquifaction of sand by earthquakes has been well-documented elsewhere, and Parker’s conclusion is supported by the complex structure of the area, with many minor folds and faults. 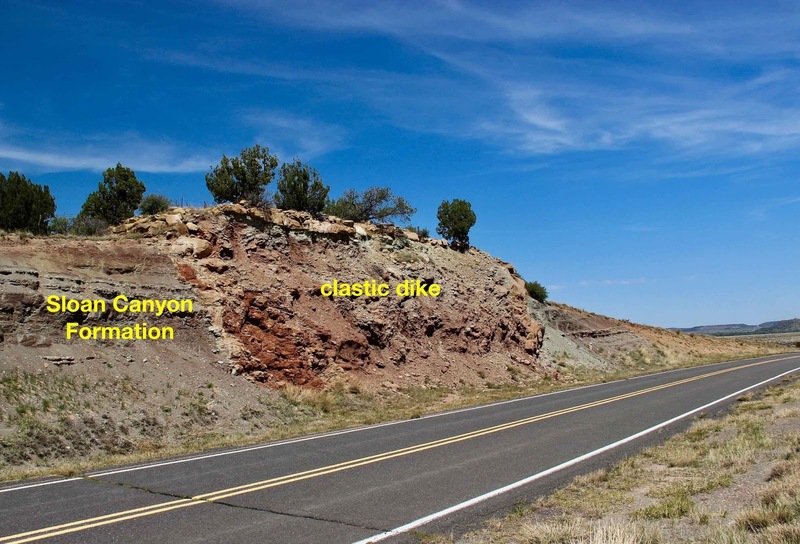 Localized post-Triassic folding could have fractured rocks sufficiently to allow sand to move. Other possible explanations include explosive volcanism, and buildup of fluid pressure in underlying sand, fracturing the rocks above. 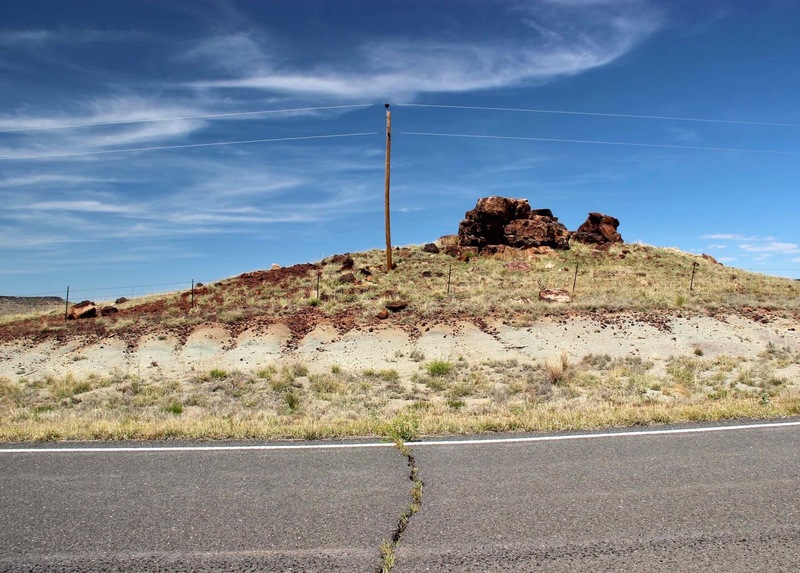 Clastic dikes occur in the Dry Cimarron valley too, but they don’t stand above the surface so aren’t obvious like the plugs. Fortunately, the builders of State Road 456 kindly cut through one. If you stop on the hill just east of Milepost 56, you too can get up close and personal with the Silent Stones of the Dry Cimarron (4). No one explained why the intrusions are red. Maybe it's due to hematite, known to be present in some, or the red Triassic rocks they passed through. 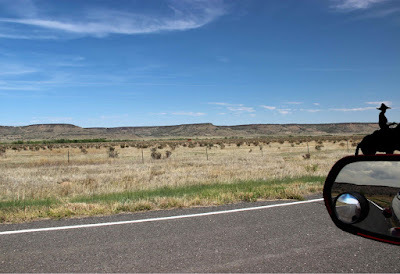 My tour followed Trip 1-B in High Plains of Northeastern New Mexico (Muehlberger et al. 2005). 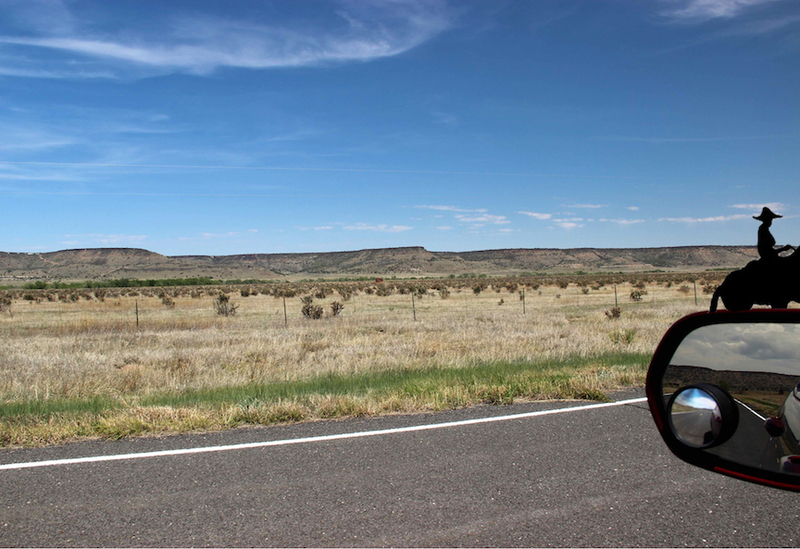 The Dry Cimarron valley is mostly privately-owned, so features must be viewed from the road. But the traffic's not heavy. Most of the time I gawked undisturbed. (1) I may have been stretching the truth. 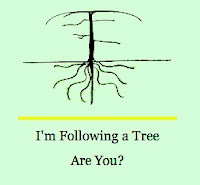 If we define ourselves by our professions, then I’m a botanist. (2) Lucas et al. 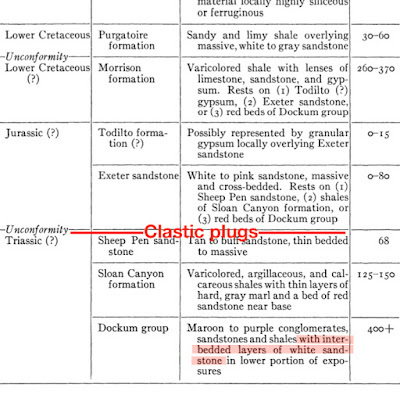 (1987) do not consider Triassic rocks of the Dry Cimarron area to be equivalent to the Dockum group in Texas. (3) By definition intrusions are igneous rocks, formed from magma. 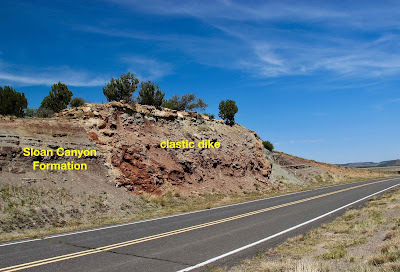 The guidebook explained away the contradiction: “intrusive in a mechanical sense—in that soft sediment can intrude upward into overlying strata.” Intrusive sandstone isn’t unique to the Dry Cimarron valley; perhaps intrusion should be defined more broadly. (4) Thanks to VMD for sharing the handy Random Western Novel Title Generator. Lucas, SG, Hunt, AP, and Hayden, SN. 1987. The Triassic system in the Dry Cimarron valley, New Mexico in Northeastern New Mexico, New Mexico Geological Society 38th Annual Fall Field Conference Guidebook. pp. 97-117. Muehlberger, WR, Muehlberger, SJ, and Price, LG. 2005. 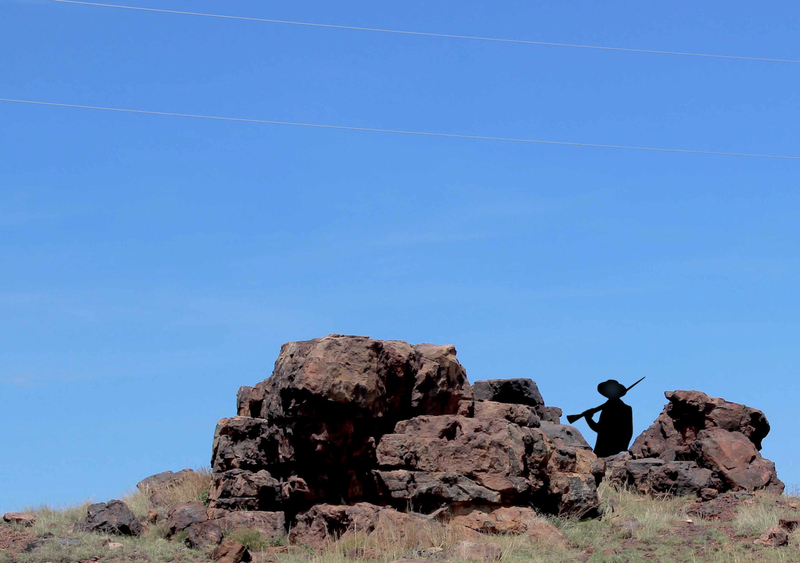 High Plains of northeastern New Mexico, a guide to geology and culture. 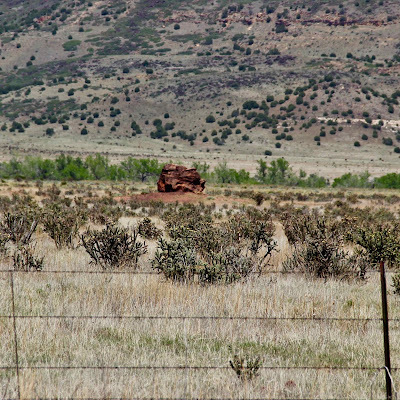 NM Bureau of Geology and Mineral Resources. Parker, BH. 1933. 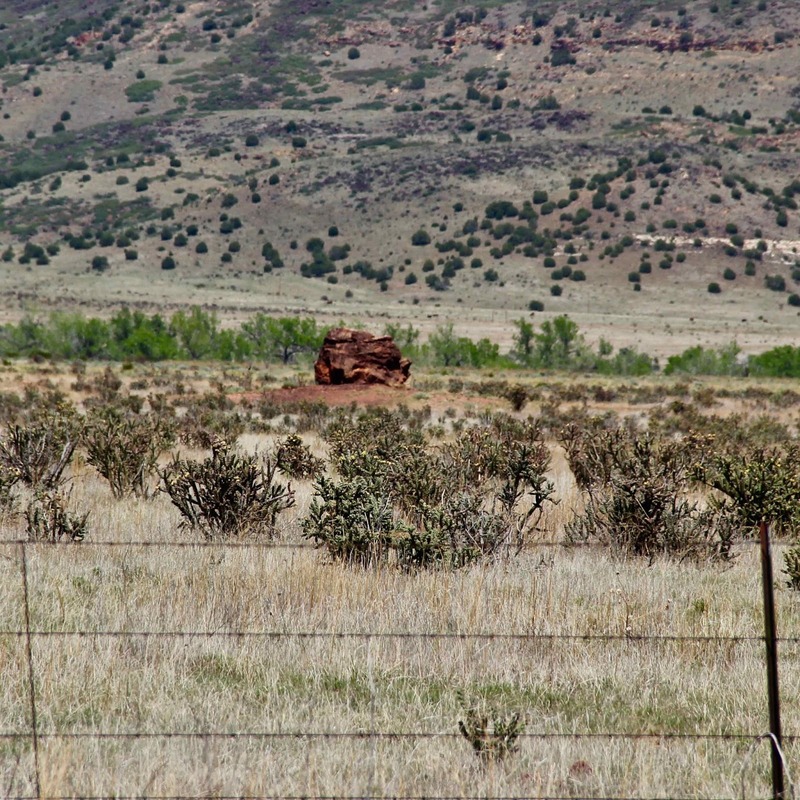 Clastic plugs and dikes of the Cimarron Valley area of Union County, New Mexico. 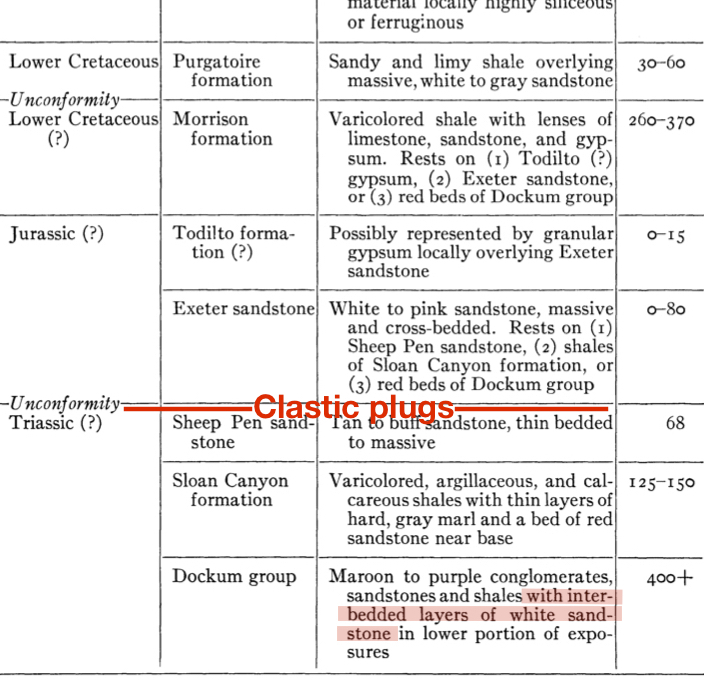 Journal of Geology 41: 38-51 (http://www.jstor.org/stable/30084929). 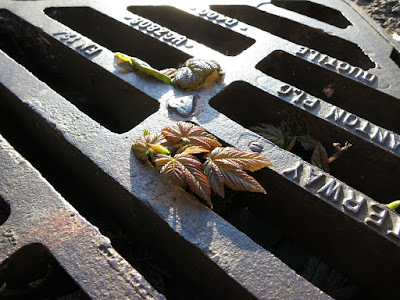 Five years ago, I came across a blog post about a young sycamore (maple in the USA) emerging from a street drain! 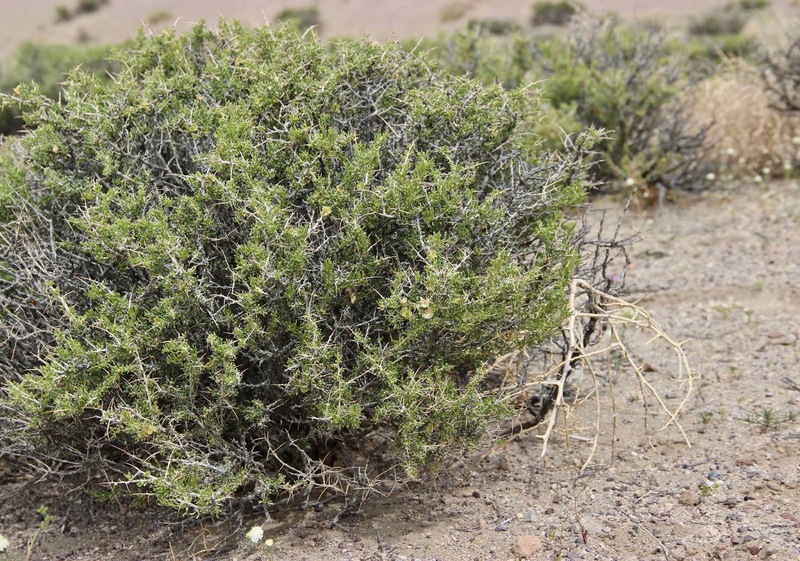 It was discovered by Lucy Corrander, a member of a loose-knit group of tree-followers. Lucy informally “led” the group by periodically listing recent tree-following posts. 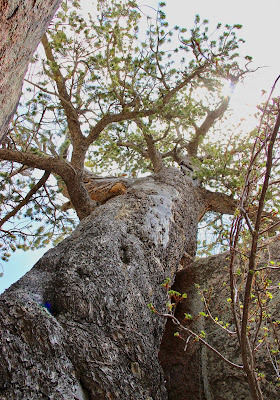 Anticipating tree camaraderie, I decided to follow a limber pine (Pinus flexilis). 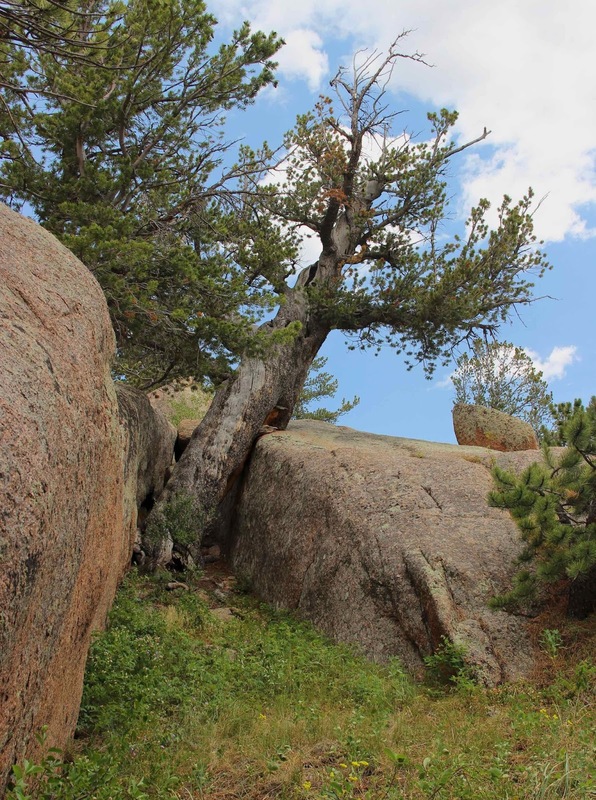 Like Lucy’s sycamore, it started life in a dark out-of-the-way place—a five-foot-deep crevice in a granite outcrop. That must have been many hundreds of years ago, judging by its situation and size. Sycamore (maple) emerging from its dark wet home in 2012. Lucy reports it’s still growing there! Limber pine emerging from a granite crevice near Blair Picnic Area in the southern Laramie Mountains. There were enough tree-followers that Lucy organized monthly gatherings facilitated by Mister Linky, now hosted by The Squirrelbasket. 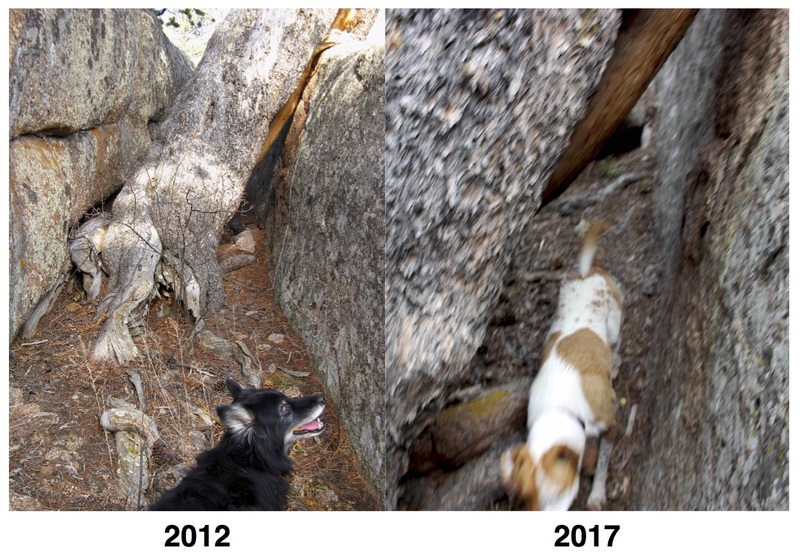 In the years since, I’ve followed a cottonwood, a willow and a serviceberry—always interesting and fun. Though there’s no obligation, I’ve mostly been diligent in my monthly reporting … until this year. That’s because I decided to follow a Powell palmetto, which has been extinct for millions of years. The beautiful fossilized frond in a hallway in the Geology building was irresistible. 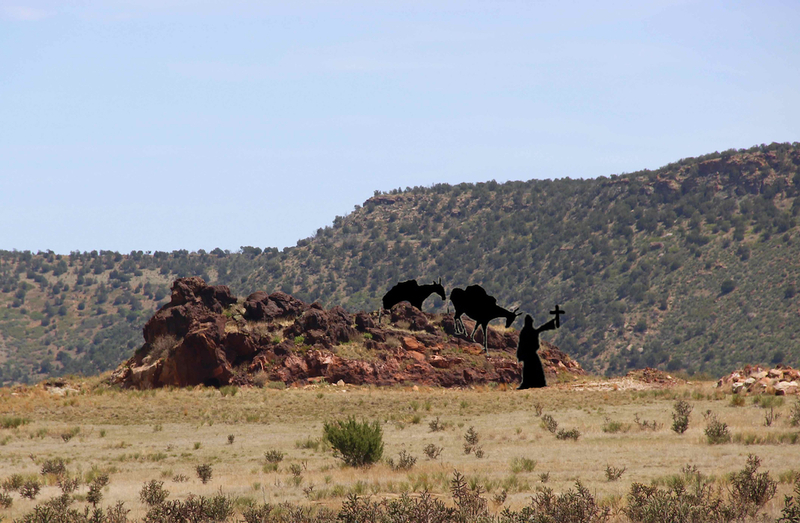 But I soon ran out of palm and fossil stories, and work and weather have kept me from visiting its lithified habitat on the other side of Wyoming. 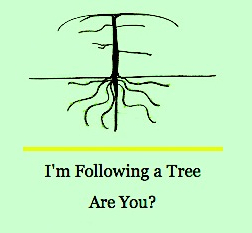 In the meantime, I’ve wandered from tree to tree. 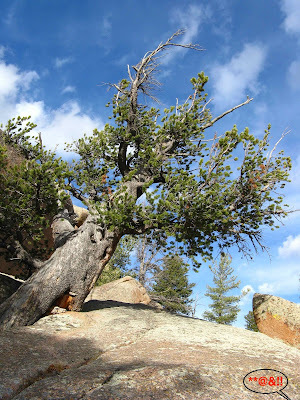 This month I visited my old friend, the limber pine. From the approach, it hardly looks impressive—half dead and leaning severely. But up close, it’s spectacular! What character!! I like to look at the big scarred tree leaning against the rock and imagine its early years, back when it was a slender youngster living down where the sun rarely shone and snow melted late each spring. It couldn’t have grown more than a minuscule amount each year! 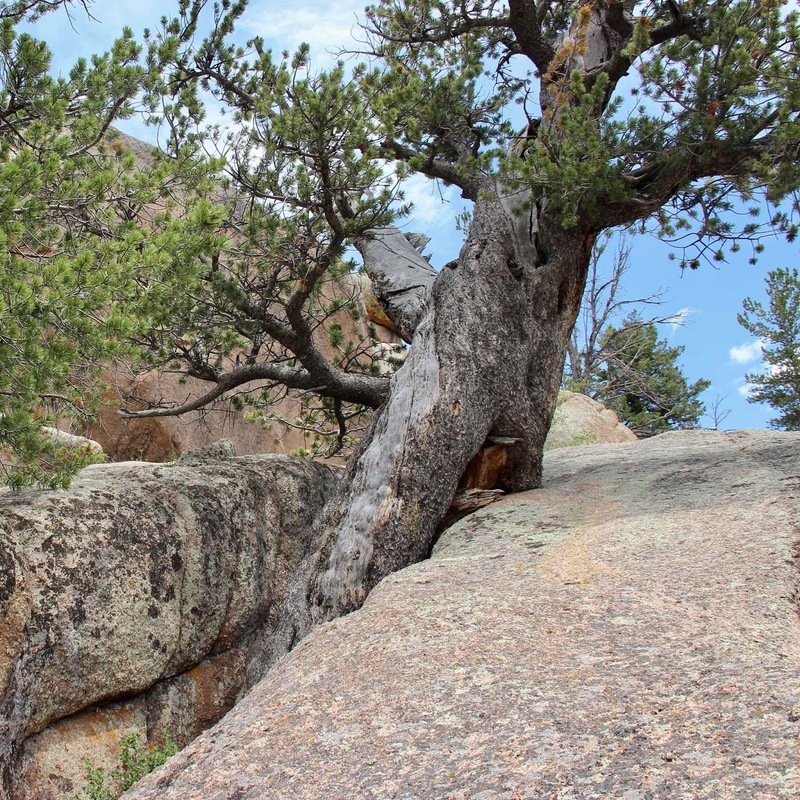 When the sapling reached the rim of the crevice, did it experience a growth spurt? Maybe relatively-speaking. The growing season is short (8000 feet elevation), though being evergreen, a limber pine will photosynthesize in winter if there's a “warm” day. … or maybe not. On the other side, the bark joins tightly with the granite. 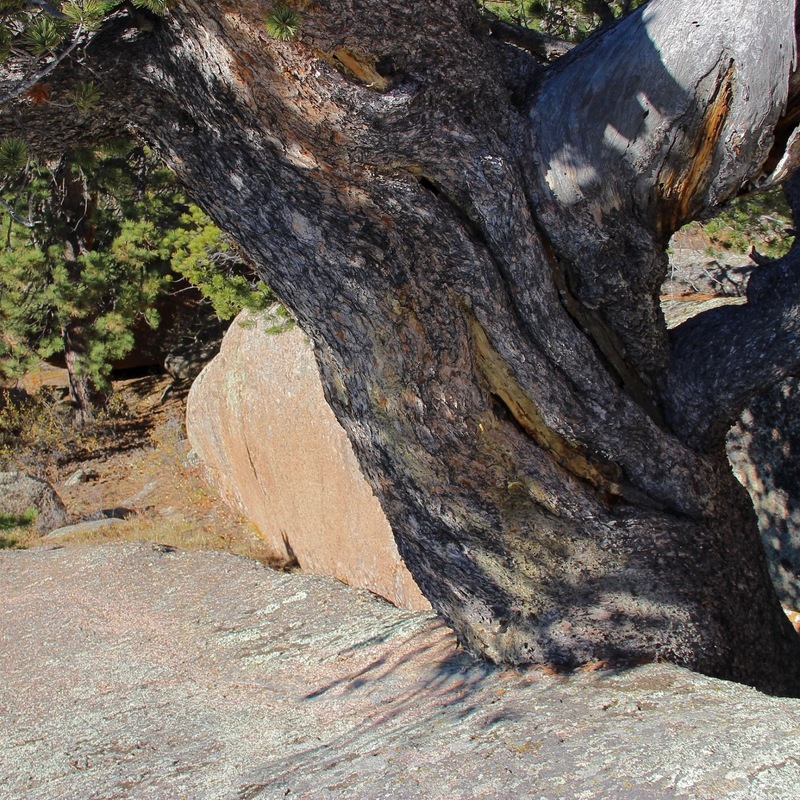 In addition to the scar at the rim, strips bare of bark wind up the trunk. 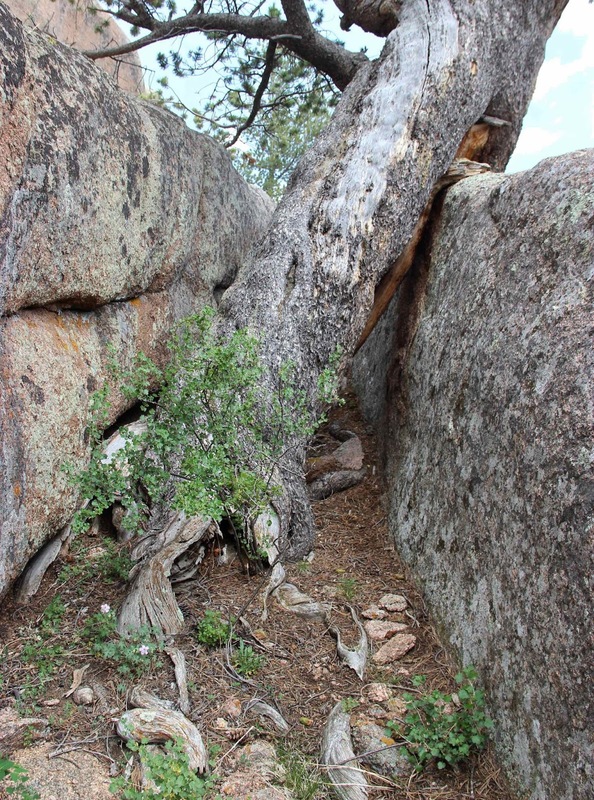 Several large roots are exposed and vulnerable, if not already dead. A good portion of the crown is dead. But the remaining live branches are healthy, their branchlets thick with needles. The limber pine looks healthiest viewed from above. As for change … there were some obvious ones. Several minor branches covered in green needles five years ago are now brown. Five years ago my field assistant was Sparky, who was always happy to pose when I pulled out the camera. Now Spark is gone, replaced by Emmie, who still hasn’t figured out what a camera’s for, even after three years of fieldwork.